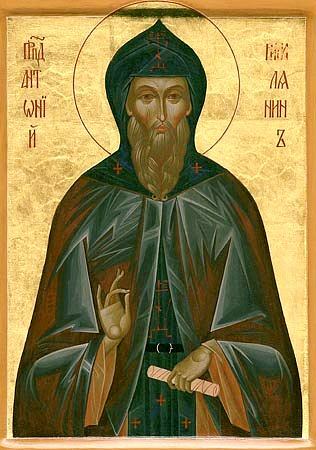 The Monk Anthony the Roman was born at Rome in the year 1067 of rich parents, keeping to the Orthodox confession of faith, and he was raised by them in piety. As an orphan having lost his parents at age 17, he took up the study of the fathers in the Greek language. Afterwards he distributed part of his inheritance to the poor, and the other portion he put into a wooden box and threw it into the sea. And then he took monastic vows at one of the wilderness skete-monasteries, where he lived for 20 years. A persecution of the Latins against the Orthodox forced the brethren to separate. The Monk Anthony wandered about, going from place to place, until he came upon a large rock upon the solitary shore of the sea, where he lived for a whole year in fasting and prayer. A terrible storm, happening on 5 September 1105, tore away the stone on which the Monk Anthony was situated, and threw him into the sea. On the Feast of the Nativity of the MostHoly Mother of God the stone halted 3 versts from Novgorod on the banks of the River Volkhov near the village of Volkhovsk. This event is testified to in the Novgorod Chronicles. At this place the monk, with the blessing of Sainted Nikita the Hermit (+ 1109, Comm. 14 May), founded a monastery in honour of the Nativity of the MostHoly Mother of God. In another year fishermen fished out the box with the inheritance of the Monk Anthony, cast into the sea many years before. Having declared what was in the box, the monk took the box and bought land for the monastery. Spiritual asceticism was combined at the monastery with intense physical work. The Monk Anthony was concerned, that from the monastery income help should be rendered for the needy, and for orphans and widows. In the year 1117 the monk began construction with stone at the monastery. Up until our own day there has been preserved a cathedral in honour of the Nativity of the MostHoly Mother of God – built during the lifetime of the monk in the years 1117-1119 by the reknown Novgorod architect Peter, and with wall-frescoes in the year 1125. In the year 1131 Sainted Niphont of Novgorod made the Monk Anthony hegumen of the monastery. He died on 3 August 1147 and was buried by Sainted Niphont. The Monk Anthony was glorified in the year 1597. His memory is noted likewise (in honour of the uncovering of the relics) on the first Friday after the feastday of the First-Ranked Apostles Peter and Paul (29 June), and on 17 January – on the same name‑day when the memory of the Monk Anthony the Great is celebrated. The first life of the Monk Anthony the Roman was written soon after his death by his student and successor as hegumen – the priestmonk Andrei. A collected life, with an account about the uncovering of the relics and praiseworthy discourse, was done by a novice of the Antoniev monastery, the monk Niphont, in the year 1598.